Gone will be the colorful submission cards for each class of the World Dairy Expo collegiate and postsecondary judging contest. They will be replaced by a digital platform complete with tablet submission and instantaneous results. 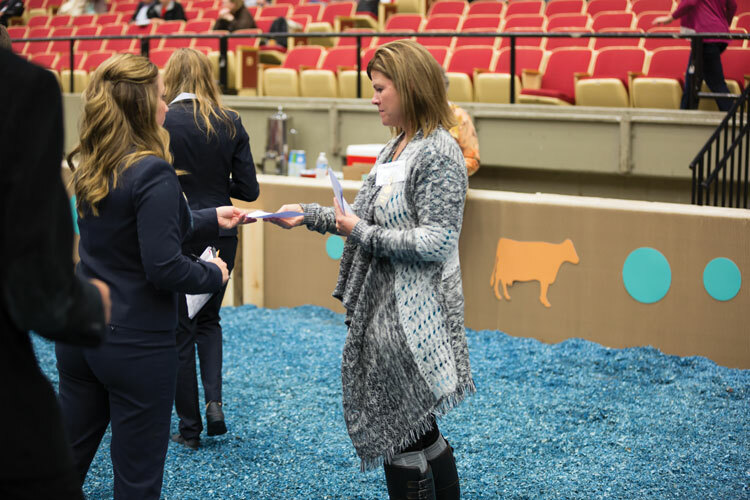 More than 100 contestants from across the United States and Canada will fill the World Dairy Expo showring to evaluate twelve classes of dairy cattle as part of the postsecondary and intercollegiate dairy judging contests. New this year, when each contestant has made a final decision on the class placing, the contestant will not turn in a traditional paper placing card. Instead, each contestant will walk up to a digital tablet to submit their placing. It will stand as a landmark shift in how the contest is conducted and tabulated. Historically, contestants marked a final placing on a paper card and turned it into a volunteer standing ringside. Then, the paper placing card was passed along to a runner to take to volunteers that manually inputted each card into a digital system for scoring. The process involved many hands and spot checking along the way to ensure accuracy. 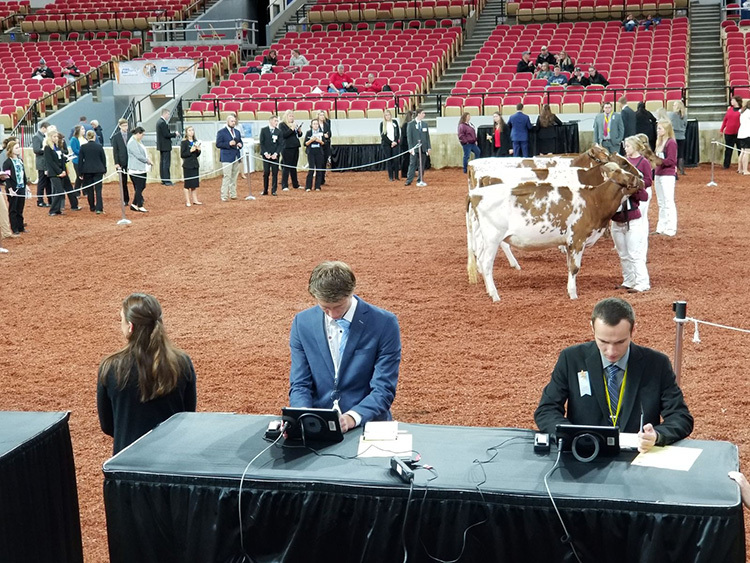 World Dairy Expo staff worked alongside a Madison-based information technology company to establish another tailor-made system for the dairy judging contest. Twenty digital tablets will be placed around the ring, explained Magnochi. The process will take around one minute (or less) for each contestant to submit a placing. Like a credit card pin pad, the tablet is equipped with shields on the sides to ensure the information entered is out of view from others. One-by-one, contestants will approach one of the digital tablets and scan a unique barcode that represents his or her contestant number. These barcodes will be on a lanyard worn by each contestant. A screen will appear showing a menu of breeds, followed by a list of class ages. Following these two selections, the contestant will choose their placing for the class, review it, and confirm all information is correct before submitting. Magnochi notes World Dairy Expo plans to have volunteers standing by the tablets in case questions arise. Like when contestants filled out a paper entry card, each contestant will need to complete the digital submission process during each of the twelve classes. Fifteen minutes are allotted for evaluation of a nonreasons class, and 18 minutes are allotted for evaluation of a reasons class. As a precautionary measure for the inaugural year of the digital system, each contestant will also have a paper placing sheet to record all placings, and it will be turned in at the end of the contest. A similar process will be used to collect scores for the six sets of oral reasons each contestant prepares and gives to a judge. Each judge listening to oral reasons will have a digital tablet. The contestant will scan his or her unique barcode upon entering the room, and the judge will enter the reasons score and submit the information following completion. The process will streamline the contest for World Dairy Expo staff, dairy judging contest superintendents, and volunteers — especially when it comes to the tight timing between the completion of the contest and the awards banquet held on Monday night. “Because all of the reports needed to analyze the contest have been built into the system, once a class is completed, the results are calculated and populated exactly how we need them for the presentations at the awards banquet,” shared Magnochi. In the future, Magnochi anticipates the results packet provided to dairy judging team coaches following the completion of the banquet could transition to an email with the result reports generated by the system. “We’re also looking forward to rolling out the digital system to the 4-H contest in the future,” added Magnochi. The author and her husband work in partnership with family on a 100-cow dairy in St. Charles, Ill.